Six years on from his debut album on Cadenza, Mirko Loko returns to the fold with a follow up album (“Comet Plan”) and a single (“Kolor”). 2009’s “Seventynine” long player helped catapult Mirko’s profile, not only as a producer, but also as DJ, regularly spinning alongside the Cadenza crew, and with Detroit luminaries such as Derrick May and Carl Craig. 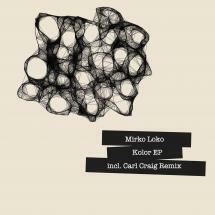 And it’s on this single that Mirko invites friend and peer, Carl Craig, to remix under his C2 guise. Wearing his influences on his sleeve, Mirko is obviously indebted to the techno music of the Motor City, and these classic Detroit tropes are certainly used in the building blocks of the original mix of “Kolor”, a sprawling and pacey intergalactic journey sprinkled with a dusting of xylophones, bells & chimes, as the melody is driven forward for a heady trip across the night skies. On the flip, Planet E founder, and highly respected Detroit electronic producer, Carl Craig, weighs in with the first of a two-part remix (part two features on the digital release of the single). Keeping the 4/4 framework of the original mix, and stripping back the percussion somewhat, the C2 Remix Part One is brimming with Craig’s trademark sound, from the elastic synths and flanged percs to the heavy low end line that comes in about two thirds of the way through. And the digital release features “Part Two” of C2’s epic take on the original mix, all soaring strings and heavenly Motor City vibes all over this one! A perfect introduction to many of the aural treats in store on the “Comet Plan” album out on Cadenza in May.